The Leisure CLA60GAK has a traditional Range-style look. Featuring two ovens for maximum capacity & greater flexibility and Cook Clean Catalytic liners for hassle free cleaning. 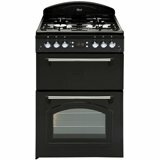 The Leisure CLA60GAK includes a 78 litre main Gas oven with Uk style burner, allowing zone cooking and traditional gas cooking results and a 34 litre secondary Gas oven for extra capacity and cooking different parts of your menu.With a fast and efficient 4 burner gas hob with robust cast iron pan supports, Auto off timer for to help keep track of those cooking times, Oven light In the main oven for easy food viewing, three wire shelves and a grill pan.